The Adventures of Team Wil-Sun: Sometimes you're the porcupine, sometimes you're the raven. Sometimes you're the porcupine, sometimes you're the raven. I ran a half marathon just outside Juneau the other day. The course was a double out and back, run along a fine yet sparsely trafficked road on Douglas Island. On my first leg out, I noticed what seemed like an ENORMOUS pile of offal on the edge of the road: stomach, intestines, various squishy things. But I didn't spot a carcass. This comforted me, slightly -- surely a large predator would have eaten that, so perhaps a careless hunter had field dressed an animal and abandoned the innards? I didn't notice the pile on my way back -- after all, I was on the other side of the street. I also somehow missed seeing it when I went back out for the second lap. I was struggling, a little, by that time and was just thinking about my breathing and keeping my feet from slapping hard on the wet pavement. But on my second "back" -- the home stretch of the run -- having been fortified by cheerful high school XC runners bearing brownies and Dixie cups of blue Gatorade (my FAVORITE), my spirits were lifted even higher by the chirpy "ho-ho" of ravens in the trees. 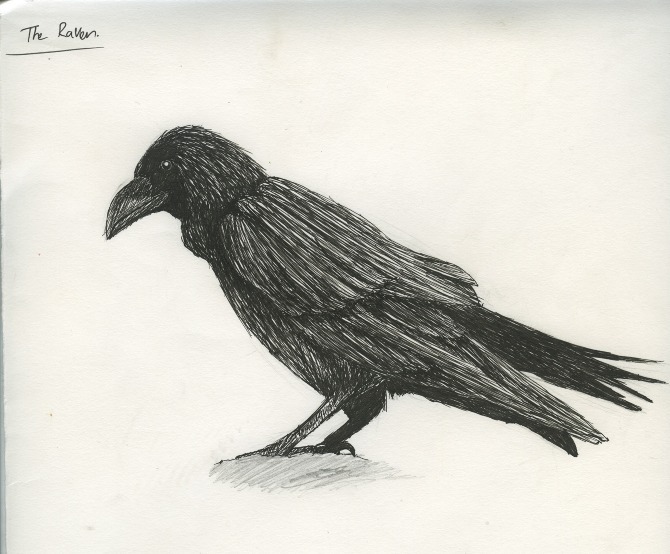 I saw one large raven off to the far side of the road, worrying at something, then looking up and staring. I moved across the road for a better look and noticed he was pecking at something... and gobbling beakfuls of flesh. I couldn't help myself and I had to move closer. As the raven hopped away, I realized it was the remains of a roadkill porcupine, much of it eaten away. Much of the porcupine's upper body had been stripped to the bone, the quills on his backside protecting his nether regions for now. The great big pile of innards had been pulled out and discarded by the choosy ravens. After we finished the race, I chatted with an old friend about life, how things were going, etc. I told him about the raven and the porcupine and we both said, "Sometimes you're the porcupine, sometimes you're the raven." I've been feeling a bit like the porcupine lately. And when my friend told me how much he liked a particular discontinued item and wondered if I could help him get some, and that if I ever left the company I should secure any remaining stock even if it meant combing through the warehouse by myself, I blurted out, "Yeah, about that... I got laid off on Wednesday." Cure awkward split-second pause as amusement-then-disbelief-then-anger all flashed across his face. Probably the same way as it did across mine when my boss's boss told me the news. Of course, in that room in that other state my focus was on holding a poker face and internally repeating "don't cry, don't cry", and while he droned on about "headwinds" and "tough decisions" and "how hard this is". NOTE: Should you ever find yourself in a position to lay someone off, don't tell them how hard it is. It's WAY harder for them. Porcupines have lots of natural defenses. Like a porcupine, I thought my quills skills offered a good defense. Branding boss, e-commerce goddess, email marketing maven, UX-pert, word girl, and team builder extraordinaire... But sometimes a big truck still slams into you. 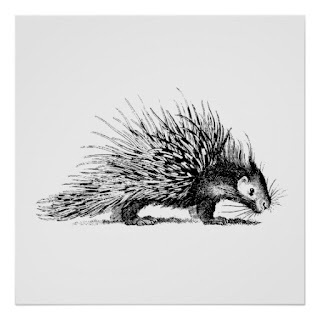 This past week I have definitely felt like the porcupine. But it's time to start feeling like a raven. Not in an eating-roadkill-by-the-side-of-the-road sort of way, but in a traditional creator/trickster sort of way. The next few weeks will be hard -- no one likes looking for a job -- but this is a chance to stretch my wings. Wish me luck. I do, most fervently do, wish you luck and tailwinds, Sunny. By the way, I see a group of ravens can be called a constable when in protective/guarding mode or, if hunting together or harassing competition, an unkindness or a conspiracy. May this journey of reinvention bring to it a "conflockgration" of your consider skills and goods deeds from the universe.